Landscaping services are not easy. There’s number of actions you need to take in order to pave the yard, set up a new garden and plant trees. That’s one of the easier scenarios yet it still involves lots of digging, tilling soil, moving ground and heavy objects etc. It’s actually unbelievable how often Irish landscapers do most of this work manually or hire multiple small and large machines to do each of these activities. At the same time landscaping companies and gardeners across Europe invest in small tractors performing all these actions with appropriate implements. Compact tractors are not ride-on mowers. They are much more than that! Of course most people will use our machines for mowing and it’s absolutely justifiable because they do perfect job. With a finishing mower attached to a compact tractor you’ll get a quality of cut same as with ride-ons. At the same time a compact tractor will do much better with steep hills or wet grass where turf tyres of ride on mower can’t move it. Then again there are different types of mowers you can install on your tractor. If you are challenged by a neglected garden or pasture, with lots of weeds, bushes and brushes you’ll easily cut it all with flail mower. And it will mulch all the clippings several times making sure they disappear in the ground after a few days. And last but not least, there are hedges. It is certain you will receive multiple jobs for trimming hedges and this may be a very time consuming work. With hydraulically controlled hedge trimmer installed on your compact tractor you can precisely trim hedges in a matter of minutes. OK, so can such small tractor come handy when doing some heavy groundwork? Well yes, definitely it will with appropriate attachments! Our tractors can for example be equipped with a mini digger powered by tractor’s PTO shaft. With 2.1m digging depth, 180 degree arm swing and multiple sizes or buckets it can easily replace compact diggers you pay hundreds of euro for every week of hire. Just think about how much you spend every year on hiring diggers. 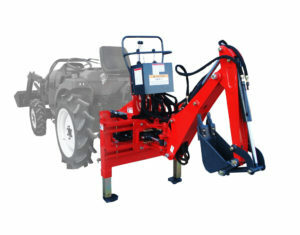 Our compact tractor diggers cost only around 3000 € excl. VAT which is equivalent of only a few weeks of digger hire. Then there’s a front-end loader you’ll use on the daily basis. 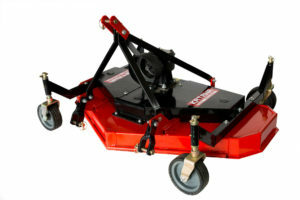 You’ll use it to move around all sorts of heavy things including tools, plants, stones and paving blocks. 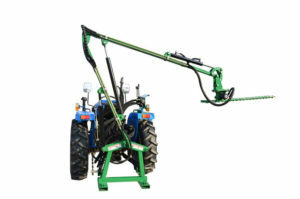 It will also be handy in levelling ground, carrying soil around and dumping it on trailers. You will never need a wheelbarrow again! It will help you lift heavy objects and put them on trucks and trailers as well as stabilizing heavy objects. And again apart from broad application of compact tractor with front loader there’s cost advantage. Hiring a skid loader every time you have a heavy duty groundwork costs ~550 € a week. A solid, strong compact tractor with a front loader may cost you only 6 500 € excl. VAT which is equivalent of only a dozen weeks of skid loader hire. And it’s yours! So you’ve shaped the ground the way you wanted. Now it’s time to seed the grass and plants. You’ll need to get rid of the stones and debris, till the soil and then level it before you seed the grass or lay down turf rolls. If you’re doing it using manual tools, hand tiller and roll you’ll spend hours or even days depending on the size of lawn you’re about to set up. All the above can be done in a fraction of time and with no effort when using a compact tractor equipped with a stone burier. 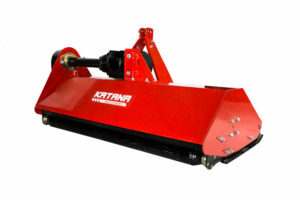 This special type of rotavator is designed to cover the full process of preparing soil for seeding grass. Its blades are different than in regular rotary tiller. They turn in opposite direction which allows them to bury stones and debris at ~5-6 inches below ground level and cover them with fine, cultivated soil. Afterwards the ground is levelled and nicely finished with a roll installed in the back of a stone burier preparing it to for seeding. The whole process is fulfilled with just one pass of this attachment. The other very useful piece of equipment for a landscaping business is a post hole digger. 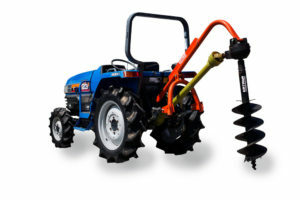 This rear mounted auger powered by tractor’s PTO will dig precise holes even in very hard soil. 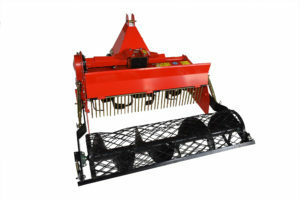 It can be equipped with different sizes of augers from 6” to 20” in diameter. It’s mostly used for planting trees and installing fencing posts. 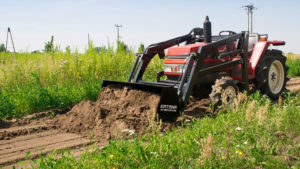 A compact tractor is not only a handy piece of equipment but it’s really a must have for a professional landscaping company. It will save you a lot of work and time letting you do more projects and increase your turnover. At the same time it will save you a lot of money left with hire companies every year. DO NOT WAIT ANY LONGER. CONTACT US FOR A COMPACT TRACTOR BEST FOR YOUR BUSINESS!